The diagnosis of cancer is jarring to the patient and his or her family. Most patients have little or no knowledge or experience navigating the health care system. Fear mixed with a large dose of confusion can paralyze a person at a time when getting informed can make a huge difference for the patient. Usually some symptoms present themselves, a series of diagnostic tests are performed and a fateful meeting with a physician jolts the patient with the 'you have cancer' discussion. After this initial jolt, it is essential that a patient and his or her family explore all the best options available to them. This is especially true when the cancer is advanced, when knowing all the facts and choices can be life altering. Cancer Treatment Centers of America is one of the excellent places a patient and his or her family ought to explore. I'd start with using their user-friendly interactive web page. You can see: the data on their superior clinical results, the folks on the treatment team, the cutting edge technology available, the unique team approach to treatment and care, and a large array of integrative therapies to compliment traditional treatment modalities. Knowledge and choice is power! There is no time in a person's life when knowledge and choice are more important than when confronted with the diagnosis of advanced cancer. This is the time to think about Cancer Treatment Centers of America as a possible partner in your fight to beat cancer. 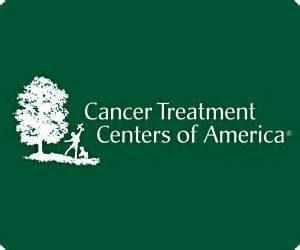 Visit their very interactive and informative web page at www.cancercenter.com or call them at 800-392-7355 to get your questions answered.